Mobile robots are designed at JPL for different environments and applications, ranging from urban reconnaissance to space exploration. 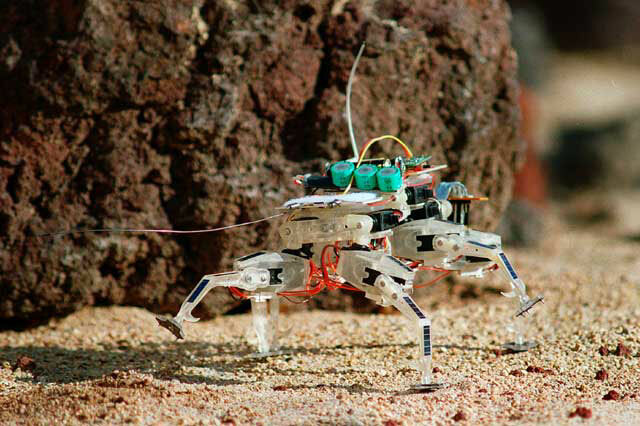 The Micro-Robot Explorer is a small, inexpensive legged robot. 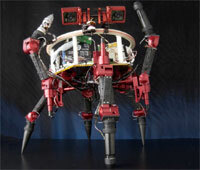 Possible future applications include, a wireless sensor web of hundreds of these robots with integrated sensor packages. Individual nodes in this web send sensor data back through the network to a base station that records and relays the data to waiting scientists. A multi-limbed robot, LEMUR (Limbed Excursion Mobile Utility Robot), is equipped with multi-functional tools and multiple cameras intended to inspect and maintain installations beyond mankind's easy reach. LEMUR-class robots push the operational envelope of robots in their size class (sub-10kg) through the flexible use of limbs and adjustable tools. They are intended as robotic instantiations of a multi-limbed primate with "Swiss Army Knife" tendencies. Dangerous situations such as search and rescue in collapsed buildings and reconnaissance in urban environments, are possible applications for an autonomous robot called "Urbie." Using a pair of robotic "eyes and an on-board autonomous navigation system, Urbie can avoid obstacles, follow virtual paths, and even climb stairs in unknown urban areas to investigate potential hazards to humans.